Nitrogen oxide and particle matters are included abundantly in the exhaust gas with the diesel engines, which use the gas oil, which has many sulfur contents. A heavy metal such as zinc, PANAJUUMU iron and copper are included in these substances, and it's difficult to fall on the ground. It remains long time getting drifted in the air, destroys ozone layer , and cause global warming. Again in the particle matters,the Carcinogenicity exists, and it becomes the cause of the Bronchial asthma and hay fever. In the shut down work environment, the work in a tunnel etc. poses a big problem on health especially. 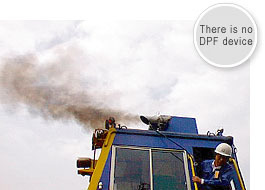 The full auto type DPF device of this company helps to clean the environment with a black smoke removal rate of 100%. The high collection rate and low pressure loss silicon carbide (SiC) filter of high heat proof is used. The inside of the filtercapture the corpuscle of the black smokewhich is discharged at porosity honeycomb system surely,and is let burn with the heater and black smoke (reproduction) is removed. 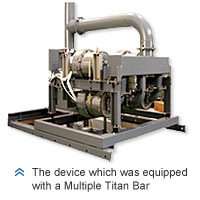 Moreover, hydrocarbon and carbon monoxide can also be purified by attaching a catalyst muffler. Even during recycling the black smoke by which collection was done by a filter, collection is being done by one side filter with mutual reproduction and regardless of the job time zone,continuous use is possible, and collection of the black smoke is 100% possible. The sensor senses back pressure, and it bypass the exhaust gas when abnormality occurs in the filter. 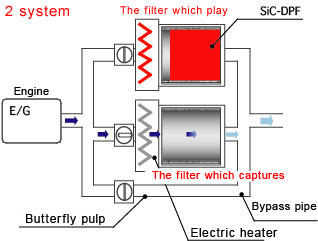 Running cost is inexpensive by not changing the whole filter but just exchanging the catalyst pellet in the muffler when the catalyst function goes down (about 2000 H). Others Good points The filter is flushed at the time of periodical inspectionand catalyst pellet exchanged. 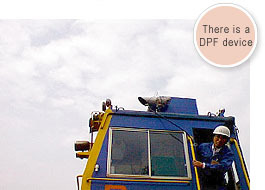 We have made good records of performance by industrial vehicles.